Thanks for visiting with us…hard to believe Sunday is already the 4th Sunday in Lent! If you can, please attend Stations of the Cross at St John Kanty at 3 on Fridays during Lent, and/or Gorzkie Zale at 3 Sundays at St John Gaulbert. This very beautiful artwork of St John Kanty Church is one of many nice items in our basket raffle, which takes place on April 14. 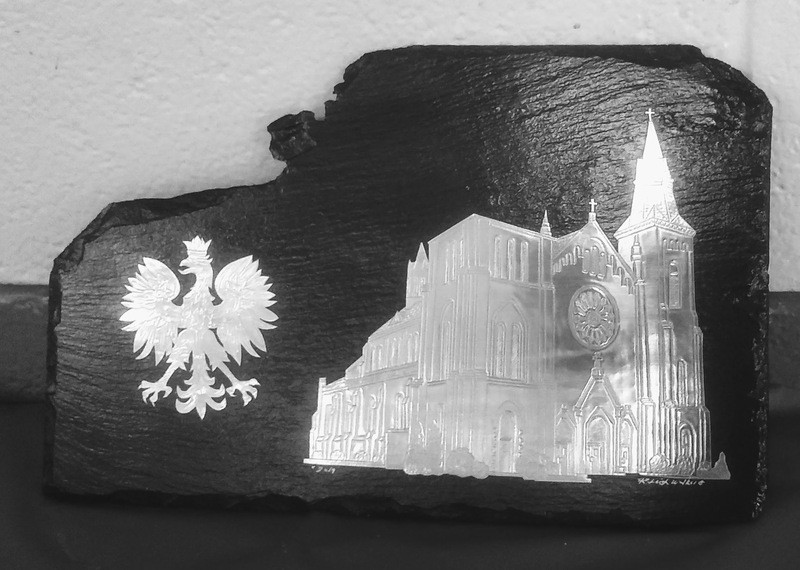 It was made by one of our volunteers on Team Pierogi, who mounted his design on slate blown off the church during a recent windstorm. Stop down to Kanty’s Kitchen to take chances on the items in the basket raffle, and pick up some homemade pierogi and placek too! Saturdays 3-5; Sundays 9:30-noon.